The school year is coming to an end, but Catholic High students have not slowed down! 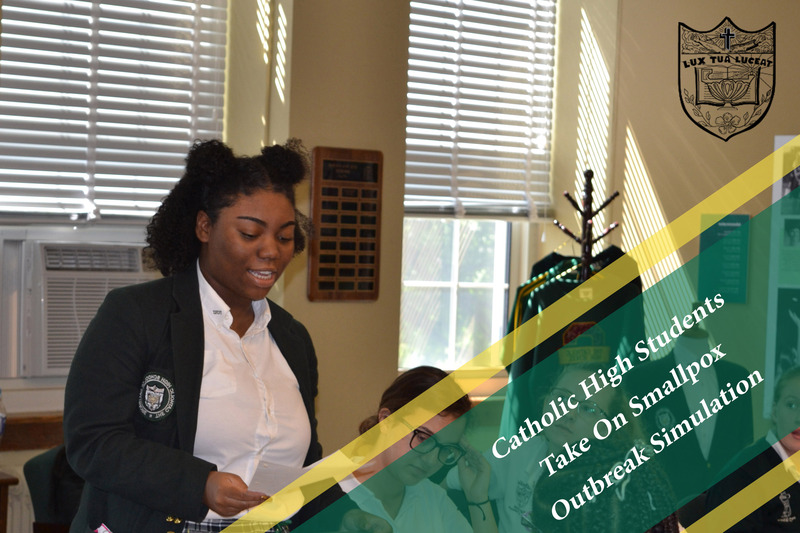 Catholic High’s Epidemiology and U.S. Government classes participated in a three-day outbreak session as an interdisciplinary lesson. Throughout the three days, students navigated through a real-life smallpox outbreak which occurred in three U.S. cities. Each student was given a role which they had to maintain throughout the whole simulation. The scenario took place in 2002, where three states including Oklahoma, Pennsylvania, and Georgia, were affected by the smallpox epidemic. What started out as nine cases eventually spread to over 2000 cases amongst 12 states! At the same time, students were busy deliberating over a national crisis with Kuwait and Iraq and trying to decide whether the United States should go to war. Isabella also researched acts, such as the Stafford and Federal Quarantine Act, to inform other participants on how to move forward. As the three days progressed, students continued to receive memos that guided them along, as well as presented challenges that they would face in a real-life situation. Another student that participated in the outbreak simulation was Kayla Harrison ’19. “During the outbreak simulation, it was really interesting to see how the process happens in real life. We definitely submerged ourselves in our roles and tried to do our best to have a successful outcome,” shared Kayla, Director of FEMA. When the three days came to an end, all participants expressed that the outbreak simulation put their problem solving, creative thinking, and time management skills to the test! There were times that the students struggled but “thankfully Mrs. Prentice and Mrs. Robinson-Brown were there to help us along the way,” Isabella stated. Thank you to Mrs. Prentice and Mrs. Robinson-Brown for collaborating on this outbreak simulation that allowed students to better understand what they have been learning in class! Next news article: Follett Online Bookstore! Previous news article: Catholic High Lacrosse Team Wins Championship Game for Second Year in a Row!